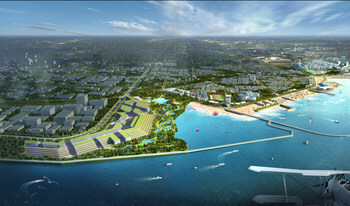 This urban design for the Shanghai Jinshan Coastal Area strives to create a Maritime City for Shanghai. Located along a 7km long stretch of Shanghai shoreline; the beach, harbour, and bay elements of the project combine to create a leisure-oriented shore coastal city. The design provides year-round sight-seeing opportunities while also allowing the public to enjoy the commercial aspects and explore the bay. The project’s design is inspired by a range of natural elements, including the grace of the pearl, prosperity of the plantain, and the romance of the clover. To ensure the design retains a kind of organic unity, there needs to be a cohesive interaction between the port and the city where one influences the other. The more coordinated the development is between the two, the stronger the degree of association. With the modern progress and strengthening of industrial, transportation developments, marine technology and international economic ties, the old port has the potential to grow more prosperous. These factors will also promote the growth of the city as the port provides favourable conditions for urban development.